It is time for a new round of congratulations. The first two go to Eva and Björn who were MSc students in the lab for the past months working on astrocyte Ca2+ signaling and potassium clearance. ‘Were’ because their theses have been written, corrected and submitted and we are fairly certain we will have to address them by their appropriate title ‘Master’ soon. The third goes to Michel. He successfully applied for a young investigator grant within the DFG SPP1757 on glial heterogeneity and now got some money for a student assistant for six months (research assistant job ad). This entry was posted in News on October 19, 2015 by chrhe74. We finally managed to have our BBQ. A good opportunity to take a new group picture. 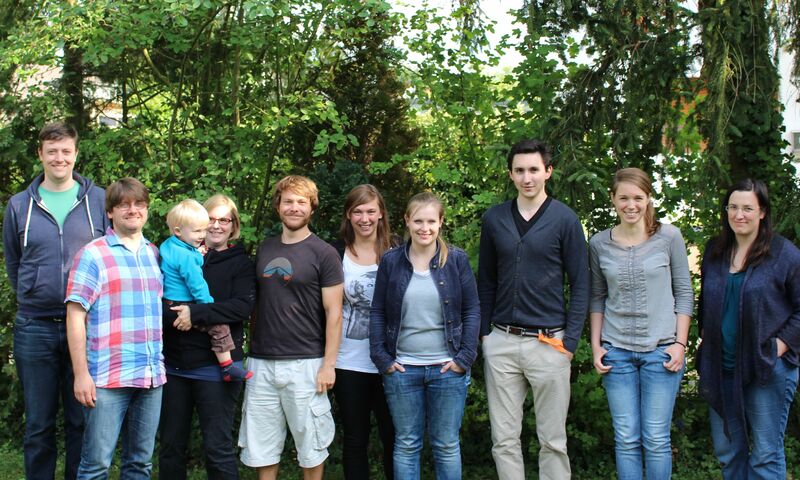 From left to right Daniel, Christian, Anne, Michel, Kirsten, Steffi, Björn, Eva and Claire. A very casual picture. But still an improvement from last year’s “Orgelpfeifen”. This entry was posted in News on July 13, 2015 by chrhe74. … to our collaborators here in Bonn in the lab of Christian Steinhäuser who uncovered a previously unknown contribution of astrocyte dysfunction to human epilepsy. Please see Publications for a link to the paper in Brain. And also congratulations to the lab of Colin Jackson at the ANU (Canberra, Australia) who successfully used ancestral protein reconstruction to design a novel optical arginine sensor. The paper is currently in press in Protein Science. This entry was posted in News on June 6, 2015 by chrhe74. Eva-Maria Schönhense (MSc. student), Björn Breithausen (MSc. student) and Anne Boehlen (PhD) have joined the lab to work on astrocyte Ca2+ signalling and potassium dynamics. Welcome aboard! This entry was posted in News on January 15, 2015 by chrhe74. Funded by HFSP and DAAD we a re developing and testing optical sensors for neurotransmitters and other signalling molecules in the brain. Actually our collaborators in Austra (lab of Harald Janovjak, IST) and Australia (lab of Colin Jackson, ANU) are doing the hard work of designing the sensors while we test their suitability for imaging in intact tissue. To get a better understanding of what our colleagues at ANU are doing and to learn how to synthesize sensors ourselves here in Bonn we paid them a visit in November. Needless to say it was quite pleasant to swap a northern hemisphere November for spring in Australia. More importantly, we now know how to produce the optical sensors ourselves. 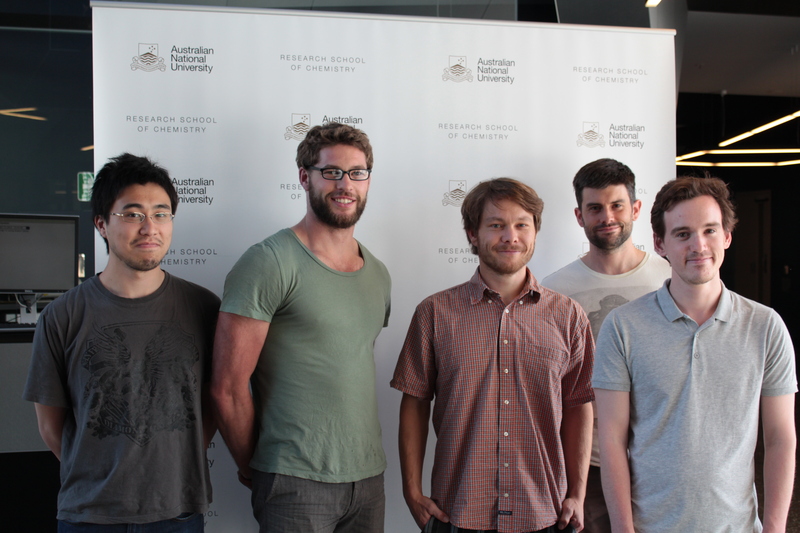 Also a first manuscript is nicely shaping up (sensor team ANU from left to right William Zhang, Jason Whitfield, Michel Herde (UKB), Colin Jackson, Ben Clifton). This entry was posted in News on December 5, 2014 by chrhe74. A PhD student stipend is available starting 2015. The goal is to reveal how rapid changes of astrocyte gap junction coupling modify hippocampal network function. More information can be found here. Application deadline is the 11th of January. This entry was posted in News on November 15, 2014 by chrhe74. The structure of astrocytes is likely to shape the interaction between neurons and astrocytes in the brain. It is intuitive that astrocytes processes close to a synapse can more effectively modify synapse function than distant processes. Mike Stewart’s lab at Milton Keynes has now demonstrated in collaboration with us that astrocyte processes cover thin neuronal spines receiving excitatory input more than bigger spines, so called mushroom spines (Phil. Trans. R. Soc. B, link). This is of particular interest because thin spines are widely believed to represent spines at which long-term potentiation (LTP, the potential cellular mechanism of learning) has not occurred yet. It might suggest that these spines are particularly well protected from spill-in of neurotransmitter from neighboring synapses. In a separate study we were wondering if morphology of whole astrocytes is heterogeneous within a brain region. Using fluorescence imaging in brain slices we could reveal that brain regions occupied by individual astrocytes can be oriented along principal cell dendrites (hippocampus, CA1 region). A subset of these cells had a morphology that could promote intracellular diffusion along along principal cell dendrites. Indeed astrocyte coupling, a key feature of astrocyte networks, was anisotropic and more pronounced along the same axis (Phil. Trans. R. Soc. B., link). These observations imply that astrocyte morphology determines spread of a diffusible signal within a gap junction coupled astrocyte network and can give it a directionality. … and of course congratulations to all authors. This entry was posted in News on September 21, 2014 by chrhe74.